Block off your calendar, because Sam Comfort will be speaking at the PSBA September meeting. Make more beehives than there are televisions. 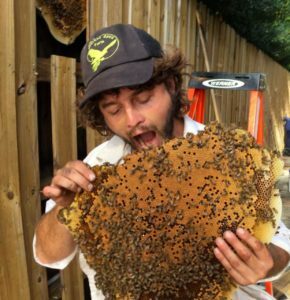 Have a good time, all the time (with bees). 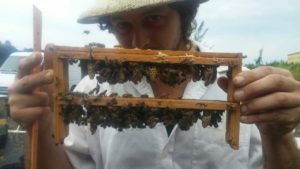 Anarchy Apiaries runs around 1000 hives and 500 mating nucs on the permaculture principal of minimal input; no treatments, less feeding, and do-it-yourself hive boxes in New York and Florida. Through teaching self-contained, self-reliant beekeeping, he hopes to make it more affordable, approachable, and enjoyable, as well as bring the means of production back to the beekeeper. Don’t miss this rare opportunity to listen to Sam Comfort outside of a conference venue! PSBA meetings are free and open to the public and anyone with an interest in bees is welcome to attend.